French fans dared to dream of a World Cup victory on Sunday as they prepared to watch the game on a sunny summer weekend after a tournament that has lifted spirits and led to a rare sense of national unity. Football fever has slowly built over the last four weeks as the country took its young national team to heart, with ecstatic scenes after their semi-final victory, a sign of the country’s hunger for success. On what is a traditional holiday weekend to mark France’s national day, many families will watch from camp sites or hotels, while giant screens have been erected in 230 fan zones across the country under exceptionally tight security. The biggest gathering of all is expected in Paris where 90,000 will converge on a fanzone next to the Eiffel Tower — walking distance from the Champs Elysees boulevard where all great national triumphs are celebrated. 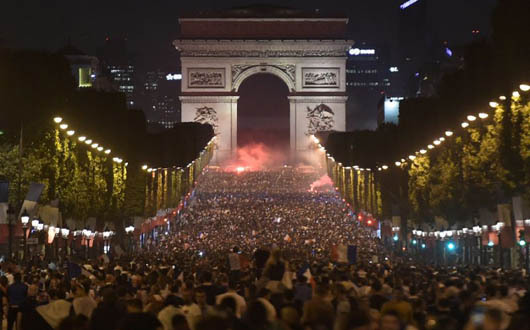 On Tuesday, when France beat Belgium to qualify for the final, hundreds of thousands of revellers gathered on the Champs Elysees. And if Les Bleus end up striking gold on Sunday, police expect the numbers there to be far higher. With success on the pitch, a country riven by tensions and still shaken by a string of attacks that have killed nearly 250 people since 2015 has been able to revel in a newfound feeling of togetherness. “We must be proud to be French! We don’t say it enough,” star striker Antoine Griezmann reminded his compatriots on Friday. Despite France’s enviable lifestyle, it has lacked “joie de vivre” for years, with numerous surveys finding the French some of the most pessimistic people on Earth. Much of this is down to decades of high unemployment, mounting public debt and the homegrown terror threat of late, which has fuelled immigration fears and rise of far-right parties. The national football squad, most of whom are non-white, has provided a tonic to a divisive debate about French identity after their impeccable performance on and off the pitch as national ambassadors. “France today is a France full of colours,” star midfielder Paul Pogba, who is French of Guinean origin, said last week. “We all feel French, we’re all happy to wear this jersey. Such talk has led to inevitable comparisons with 1998 when France last won the World Cup, celebrating diversity with its “Black, Blanc, Beur” (Black, White, north African) team led by Zinedine Zidane. The optimism was short-lived, however. One person desperate for victory will be President Emmanuel Macron, a keen football supporter who will be at the stadium in Moscow with his wife Brigitte. Former president Jacques Chirac enjoyed a surge in popularity following France’s 1998 victory — and Macron too will be hoping for the same amid a poll ratings slump. A World Cup win “could indeed make him appear closer to voters. After all, football is the sport where societal differences are blurred,” said Frederic Dabi of the Ifop polling institute. And a win would likely boost economic growth, Economy Minister Bruno Le Maire said this week. One sector that is already booming is the sports apparel industry. Fans have been snapping up team jerseys, with the “authentic” Nike version repeatedly selling out despite its 160 euro ($185) price tag. Despite the excitement, security will be in the back of fans’ minds after more than three years of deadly attacks, often targeting crowds enjoying a night out. France has deployed 110,000 police and security forces across the country over the weekend, which coincided with the Bastille Day national holiday. “Everything is being done so the French can live these festive moments with peace of mind, despite the terrorist threat which remains at a high level,” Interior Minister Gerard Collomb said. At the huge gated fan zone near the Eiffel Tower, which will open four hours before kickoff, police will be carrying out pat-downs and searches under a tough anti-terror law passed last year. In case of a French victory, some 4,000 police officers will be on duty in Paris on Sunday night, and a huge area around the Champs Elysees will be blocked off to traffic until the early hours of Monday for the first time in recent memory.